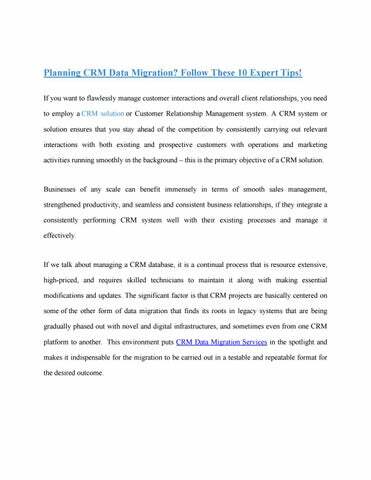 Planning CRM Data Migration? Follow These 10 Expert Tips! If you want to flawlessly manage customer interactions and overall client relationships, you need to employ a CRM solution or Customer Relationship Management system. A CRM system or solution ensures that you stay ahead of the competition by consistently carrying out relevant interactions with both existing and prospective customers with operations and marketing activities running smoothly in the background â&#x20AC;&#x201C; this is the primary objective of a CRM solution. If we talk about managing a CRM database, it is a continual process that is resource extensive, high-priced, and requires skilled technicians to maintain it along with making essential modifications and updates. The significant factor is that CRM projects are basically centered on some of the other form of data migration that finds its roots in legacy systems that are being gradually phased out with novel and digital infrastructures, and sometimes even from one CRM platform to another. This environment puts CRM Data Migration Services in the spotlight and makes it indispensable for the migration to be carried out in a testable and repeatable format for the desired outcome. Now whether you are carrying out Data Migration from Zoho to MS Dynamics or other platforms (or the other way around) you shouldnâ&#x20AC;&#x2122;t leave data migration as a retrospective action and definitely not assume that itâ&#x20AC;&#x2122;s going to be simple. Break down the legacy system use cases, prep users for forthcoming changes, frame a target CRM with the right structure, determine cutoff dates and record field exclusions, and keep reviewing data maps at a business level. Donâ&#x20AC;&#x2122;t leave data migration only for the tech team and skip migrating the historical information. Identify entities, figure the order of entity validation, and have a field to field mapping sheet at hand. Try and avoid user disruption during migration and do not forget to preempt glitches that may surface during the migration of the live system. During live data migration from SuiteCRM to MS dynamics in USA, Canada, or any other geography and pertaining to any CRM platform, diligently spend time on data mapping, meticulously compare the CRM structures, develop and hone migration tools and perform some test runs. Donâ&#x20AC;&#x2122;t miss out on any custom fields in the source CRM and make sure the data is validated. Check out for the presence of archive data in the UI. For any scale/form of Data migration services be it from ZOHO to Salesforce in Orlando FL, USA or from other leading platforms to another across the globe, we have a qualified team to steer you through. 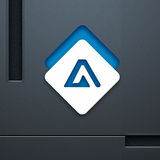 Get in touch with our consultants oninfo@advanz101.com if you want CRM Data Migration done the right way.